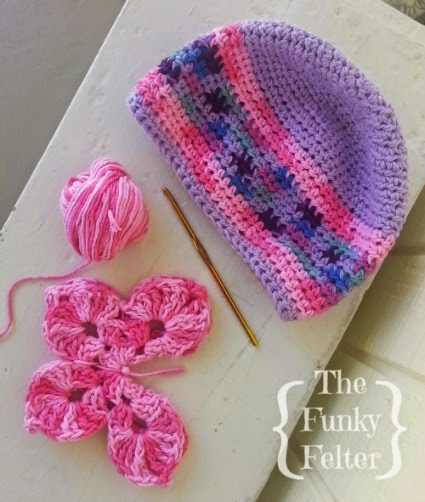 Handmade beanies and butterflies for the little girl in your life! These two crochet projects were adaptations from some that I found on Pinterest and pinned to my "Crochet Cuteness" board - the place where I bookmark bunches and bunches of free crochet patterns and inspiration for new creations. At the bottom, you will find links corresponding to the patterns above. 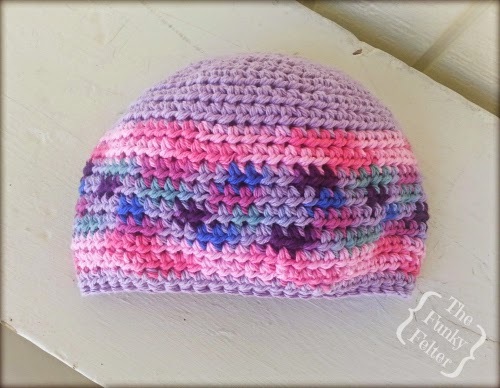 I'm including a few good options for the kid's beanie style cap as I honestly can't remember the exact free pattern that I used for it from online, although many of these simple beanie caps have very similar patterns anyway. (I have a tendency to skip around, adapt and combine patterns!) 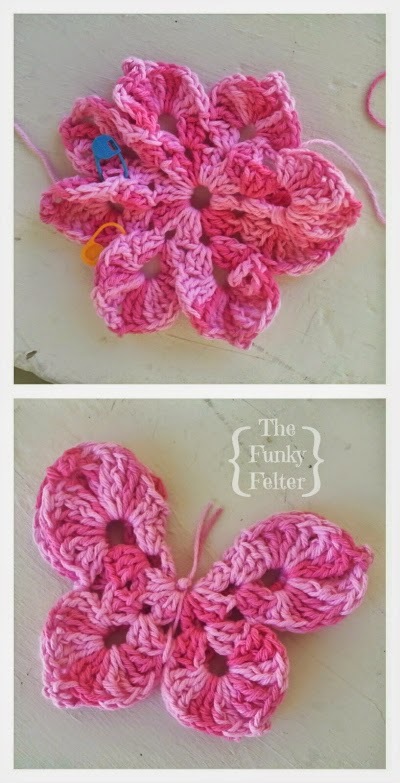 For the butterfly, I'm including the exact pattern link. Be forewarned, it is more of an intermediate level projects with some advanced stitches and assembly, but not very time consuming and well worth the effort - just adorable! As usual, I adapted these patterns slightly. For the butterfly, I only used variegated cotton yarn and a larger hook size for a bigger butterfly - no big pattern changes on that one. For the beanie cap, I also used cotton yarn and incorporated several mid-section rounds of two different colored variegated yarns creating the stripes. For the last round, I decreased slightly also by taking out a stitch (or sc2tog) every few stitches or so. Then I worked a round of slip stitches for a nicer edging to finish it off. The decreased crochet stitches made the cap fit a little more snuggly around the forehead so it didn't ride up on my little girl. I found it worked for a better fit on my little kid's head. You can see in the photo, the crocheted beanie has a bit of a puffed out shape to it because of the decreased round at the end. I hope you like the butterfly and cap patterns. You can find a lot more free crochet patterns through my Pinterest boards so do check them out and follow me! I pin great finds daily! If you liked this post and want more upcoming patterns and craft tutorials, follow me or subscribe to my feed through the subscription box on the side to get those upcoming posts. Don't miss out!